Since last CES, a couple of Asustor offerings have been put under our review scanner, and we were naturally excited to meet up with them at CES 2015. 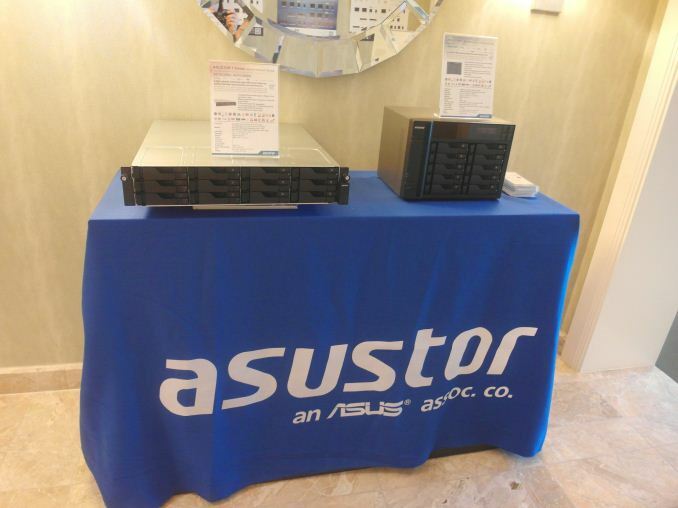 Towards the middle of December, Asustor had launched the 50T and 51T series NAS models (in 2- and 4-bay varieties) based on the Bay Trail Celerons. 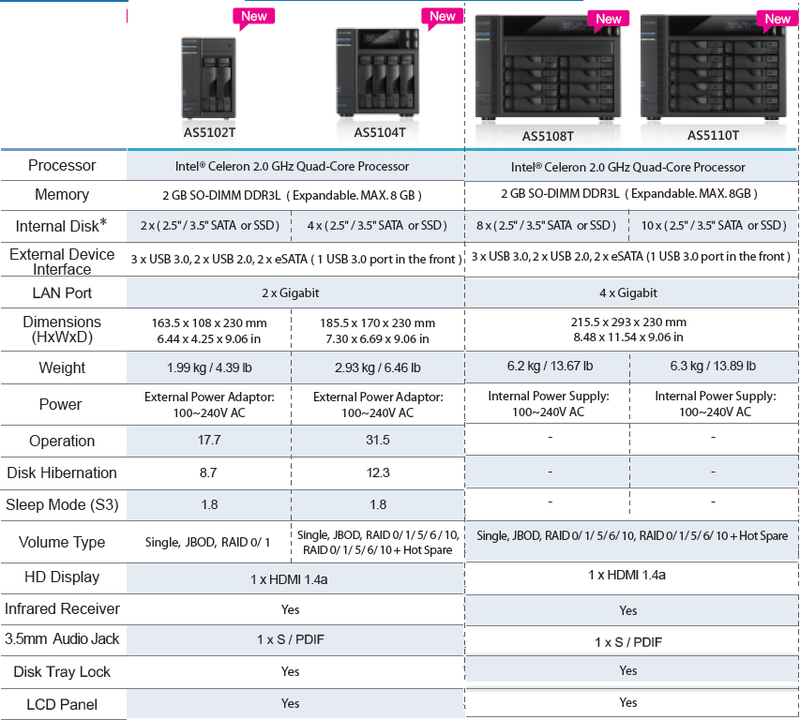 While the 50T packs the dual-core Celeron J1800 running at 2.41 GHz, the 51T uses the quad-core J1900 at 2.0 GHz. The affordable Haswell-based NAS units (Core i3-packing 70 series) were launched before the 50T series. The 70T series packs two network ports, but does have a PCIe expansion slot for 10G cards. 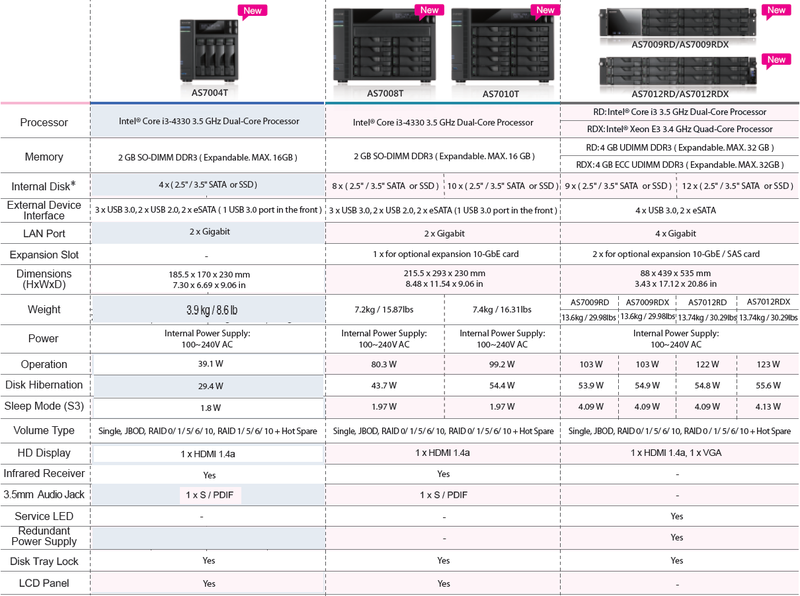 The 70R rackmount series comes in two varieties, the Core i3-packing RD ones and the Xeon E3-packing RDX ones. Both of them are targeted towards enterprise users and come in 9- and 12-bay variants. The RDX variant supports ECC RAM. As I have mentioned in our previous coverage of Asustor, the company is doing quite well in terms of hardware offerings. It is in the software department that they need to play catch-up with the QNAPs and Synologys in this market segment. Naturally, most of our focus during the CES visit was on the upcoming / newly released firmware features. Asustor claims to be one of the first NAS vendors to support S3 sleep mode for aggressively driving down power consumption in the long run. ADM 2.3 finally brings about Windows ACL support. The mobile apps ecosystem was also shown in detail - the features are pretty standard if one is coming from a QNAP / Synology background. Asustor made specific mention of the hardware-accelerated transcoding feature in their Evansport NAS - both for offline as well as real-time operations via its mobile apps. Ideally, we would like it extended to their 70T series (using the Quick Sync engine). The demo which pleased me the most was the QEMU front-end that is currently a package under beta-testing. Taking a cue from QNAP's Virtualization Station feature, Asustor is developing a package to enable ADM to act as a host OS. We saw multiple flavours of Windows running on top of a Asustor 70 series NAS. The UI is a bit basic compared to Virtualization Station, but, given the beta nature, it can definitely be excused. Asustor has always been competitive on the hardware side of things. However, by virtue of being a late entry into the market, they have perennially been in catch-up mode with respect to firmware features. That was the story from the last two CES shows, and this year was no different. That said, it is heartening to see Asustor accelerating the development on the software side, while also being quick to react to new firmware features / packages that the competition is bringing to the market. That is definitely good news for consumers in this market.